While some of these words are highly unusual, they are all fun and a bit quirky. 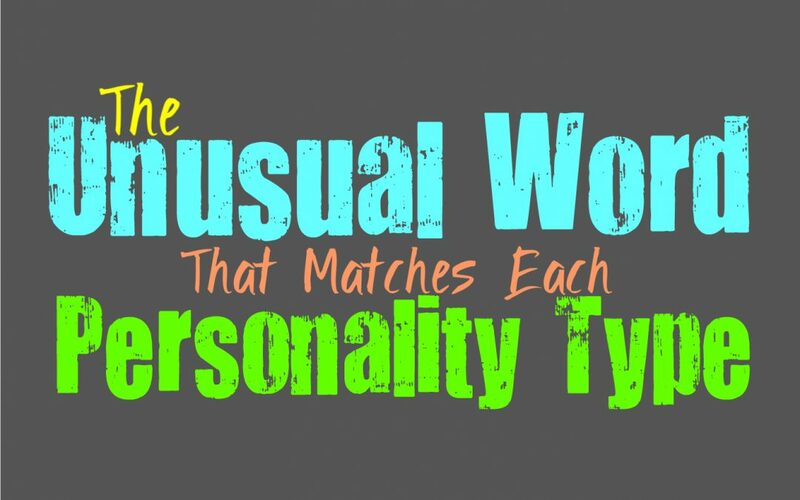 So just for fun here is the unusual or funny word that reminds us of each personality type. Collywobbles refers to a sick or uneasy feeling in your stomach, which reminds us of the INFJ because of their strong sense of intuition. Sometimes when something is off or needs to be fixed, it lends to that knot in your stomach. This is something INFJs often experience when their intuition is telling them something isn’t quite right. So the word collywobbles isn’t that far off from matching the INFJ and their ability to sense when something is off in their worlds. Someone who is a fusspot is a bit of a perfectionist, and that is definitely a great word to describe the ENFJ. While they possess many other wonderful qualities, they certainly do have a desire to make everything around them perfect. They don’t like making mistakes or doing anything that doesn’t quite live up to their own difficult standards. Because of their desire to be perfect, the ENFJ can certainly fit the unusual description of being a bit of a fusspot. Abibliophobia is a fear of running out of things to read, which can be a good description for the often bookish INFP. They love having time to themselves to dive into a good book or story. Most INFPs find themselves in love with being able to read and immerse themselves in these others worlds. Sometimes they just enjoy researching or reading books that help them learn about different topics. Regardless of what they are reading, abibliophobia definitely reminds us of the INFP. Flibbertigibbet refers to someone who is silly or who likes to chat a lot. While ENFPs might enjoy silence, they do have times when they love talking. They enjoy being playful and silly and don’t living boring lives. Their silly side definitely makes us think of the unusual and quirky word, flibbertigibbet. They are rather goofy and something talkative people, who enjoy being able to step outside of their comfort zones and be a bit over the top sometimes. While it isn’t the most unusual word on the list, it does have a unique ring to it. Cerebral just refers to someone who is brainy, or rather intellectual. This is certainly fitting for the INTJ personality, since they are very focused on improving their minds. INTJs are highly cerebral people, who are very drawn to their own internal minds and doing what they can to learn more and constantly be growing. While the word bellicose doesn’t perfect describe the ENTJ, there are some aspects of it that can be related to them. Bellicose refers to someone who is a bit aggressive and willing to fight, and in some ways this does make us think of the ENTJ. They are certainly aggressive and ready to go after their goals no matter what it takes. They aren’t afraid of standing up for themselves, and will push to make sure they get things done as efficiently as possible. Not the most pleasant sounding word, but it refers to someone who is the eternal pessimist. While INTPs aren’t always complete pessimists, they can appear this way on the outside. Their desire to be more realistic and analyze each situation, can leave them feeling more pessimistic than anything else. INTPs do have a rather cynical side which pushes them towards having doubts about whether or not things will turn out in a more positive direction. ENTPs are mischievous and curious people, which makes us think of the word shenanigans. This silly sounding word is one most of us know, and sometimes use in a playful manner. Shenanigans refers to trickery or playfulness, or someone who gets into a bit of trouble. This does make us think of the ENTP personality, since they have a tendency to get themselves into a bit of trouble because of their curious and playful nature. While it can sometimes be used as an insult, fuddy-duddy simply refers to someone who is old-fashioned or unhip. While ISTJs are capable of being hip, they often prefer things that are old-fashioned. They focus on the past and are more drawn to things they are comforted by. ISTJs don’t like being forced into the future, and can be annoyed with people who are obsessed with being hip or trendy. Too much change isn’t comfortable for the ISTJ, so they can be a bit of a fuddy-duddy sometimes. Finagle means to work around or figure out a way to get something done a certain way. ESTJs are often great at finagling their way into most things, and work hard to get what they want. They are focused people who don’t let things stand in their way and will do whatever it takes to be as efficient as possible. Finagle definitely makes us think of them, since it is something they do fairly often when they need to, in order to solve a problem or make things work. While isn’t the absolute oddest word, it does have a bit of an old-fashioned sound to it. ISFJs are certainly steadfast and reliable people, who do whatever they can to be supportive of their loved ones. ISFJs might be traditional people, but that also makes them truly dependable in the best way possible. They are always there for those they love and will do whatever it takes to provide for them and make them happy. Mollycoddle often means to pamper or indulge someone, which certainly makes us think of the ESFJ. They have a tendency to overindulge the people they love, and seek to give them whatever they want. While ESFJs can sometimes ignore that they are doing this, it comes from a good place. They simply want to please those around them and do whatever they can to make them happy. Their desire to care for others definitely causes the ESFJ to pamper the people close to them, and this fits the word mollycoddle. This unusual sounding word refers to someone who doesn’t feel the need to fill the silence with an overabundance of words. This definitely makes us think of the ISTP, who isn’t always inclined to be very chatty. Sometimes they prefer to sit in silence, and this is why they often enjoy being on their own more than with other people. They certainly are people of few words, making them rather pauciloquent. While using the term lollygag often comes as an insult, in this case it just reminds us of the relaxed and carefree nature of the ISFP. They might have a tendency to lollygag, but that is often because they enjoy living in the moment. They don’t need to overthink things or spend their energy rushing to get somewhere. ISFPs want to enjoy their surroundings, and so sometimes they might appear to lollygag a bit. A brouhaha expresses a big part of event, which definitely reminds us of the ESFP personality. They enjoy focusing on things that are fun, and can often be great at planning big events. ESFPs sometimes make a big deal out of things, and can seem a bit dramatic at times. This is simply because they enjoy living in the moment and want to seek out things that are rewarding and exciting for them.